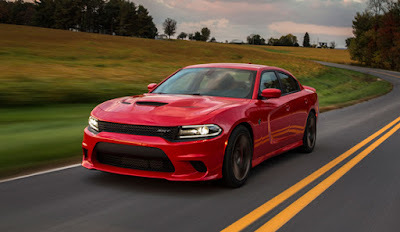 Often referred to as the most powerful stock sedan ever, and the fastest stock sedan ever, the Dodge Charger SRT Hellcat serves as both a city-street vehicle, and a performance hotrod. It comes with a supercharged 6.2-liter HEMI® V8 engine and a TorqueFlite® 8-speed automatic transmission that delivers fuel-efficiency for street driving, and maximum performance on the track. The Charger SRT Hellcat can transition from a quiet family vehicle on the street to a track racing competitor with the switch of a key. When you have the need for speed. Dodge has an answer: the red key. This car was built with street and racing technology and therefore comes with two key fobs – they don’t call it the SRT Hellcat for nothing! With the black key, the engine outputs are limited for city driving and family cruises down the road. With the red key, it can drive a quarter mile in 11 seconds flat and has a top track speed of 204 miles per hour, unleashing its full 707 horsepower. 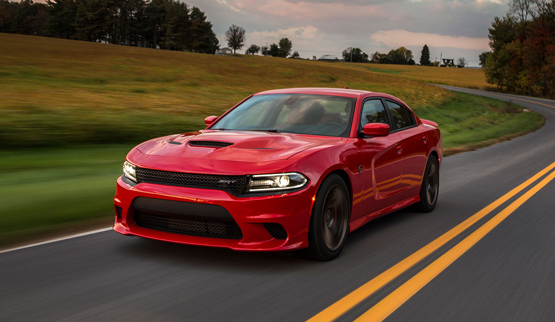 Apart from its dual key feature, the 2015 Dodge Charger SRT Hellcat was designed to customize your ride. The three different driving modes include street, sport, and track. For each driving mode, the transmission, traction, and suspension settings are customized to optimize performance. Street mode allows you to load up your family and friends and drive to an event in the city with a smooth, quiet, and comfortable ride. Sport mode gives you a more firm ride with quicker shifts to conquer those windy roads that curve up a mountain or through a canyon. Lastly, track mode is for when you are ready to experience the power of the Hellcat. This mode brings the maximum performance capabilities of the vehicle with the most aggressive suspension, transmission, steering, and traction settings to leave your competition in the dust. The 2015 Dodge Charger SRT Hellcat is the real deal – a family car in the city, and a race car on the track. With several features and customizations, this model was built to perform.